You can have confidence that our tenured team of project managers will complete your Denver area acoustic treatment project right the first time. Our goal is to lead the acoustic treatment industry with new construction innovations, taking cutting edge ideas and materials and creating something new. Our number one goal is your complete satisfaction with the acoustic treatment services we have provided for you in Denver and nearby communities. We stand apart from the rest because of our keen attention to detail. New tools and technologies like Eurospan Stretch Systems are constantly being developed and included in our offering. Innovative Interiors & Construction is going to bring the latest and greatest to the table. The brightest project managers and installers in the industry. 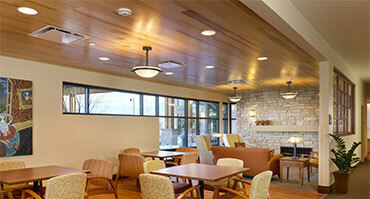 There is a reason our name is mentioned first, we are the best in commercial acoustical treatments. 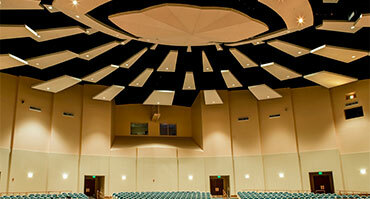 Acoustical stretch fabric systems are state of the art. These “manufacture in place” systems can accomplish some of the most technical and complex jobs. In partnership with Owens Corning and Conwed Designscape, Innovative Interiors & Construction can bring you the acoustical treatments needed with a clean seamless finish. 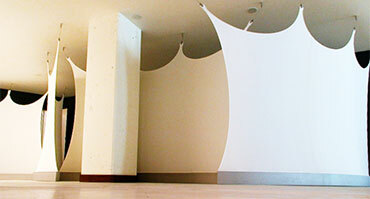 Let our team of acoustical experts help you design, manufacture and install custom ceiling and wall acoustical panels. We can help you design a system that blends right into and looks just like drywall, or we can help create a visual point of interest. These treatment types can seen commonly used in theaters and auditoriums to modify acoustical attribute of the room in addition to adding visually pleasing design. Need an artistic or modern look to polish the look of the project. With the variety of aesthetic designs, textures and unique systems, acoustical treatments can offer a modern and aesthetically pleasing finish. Translucent ceilings give a very modern and clean looking finish, while metal and wood ceilings can give that altogether unique look that will set your project apart. Innovative Interiors & Construction is committed to every detail of your project. If unparalleled quality and a timely job are important to you contact us today for a evaluation and estimate. Nobody brings more experience or a greater level of craftsmanship. IIC has been delivering world class construction and installation of specialty acoustical treatments for nearly 25 years. Our vast knowledge will ensure that your project gets all of the right attention. You can count on our ability to recommend the best and most cost effective approach to your project. Our experienced team of installers are fast and will get the job done right. Our high standards ensure that you will always be satisfied with the work we have completed. Focused attention to detail and a craftsman’s heart, will not allow us to deliver any thing short of complete satisfaction. Our commitment to safety is a number one priority. Each team member is trained and coached in safe work environment best practice. You can have confidence in the care our staff take to promote safety on every job. Our commitment to safety is a number one priority. Each one of our team members is trained and coached in safe and smart work environment best practices. Offering a team that you can count on. With 3000 plus projects under our belt no one compares to the quality that Innovative Interiors & Construction delivers. We have the most experienced staff in the industry and have the work to show to prove it. Get it done right the first time by calling Innovative Interiors & Construction today.